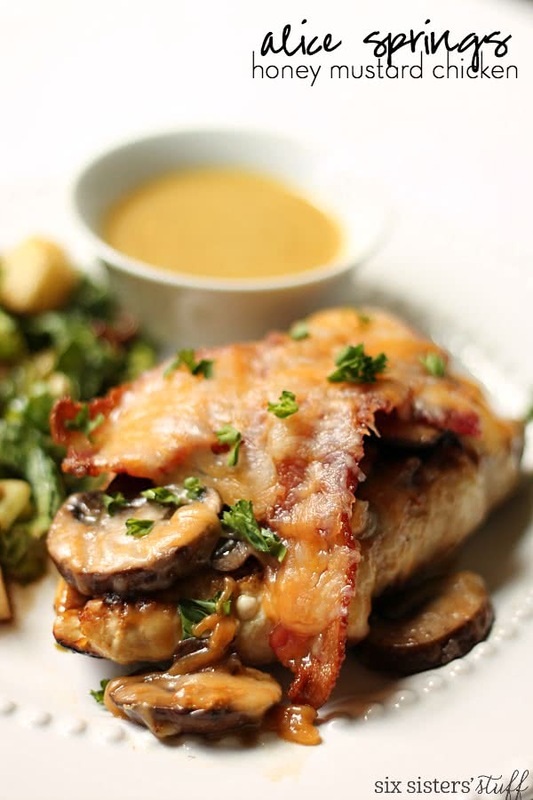 Looking for a copycat recipe for Outback Steakhouse Alice Springs Chicken and Honey Mustard? This copycat will wow you and your family and will become a regular hit at your table. I am always looking for ways to “spice up” plain ol’ chicken breasts and this recipe became one of my top favorites! Whenever we go to Outback Steakhouse, my husband always gets a big steak and I always order their Alice Springs Chicken. Then when I found this recipe, I decided to put it to the test to see if it tastes anything like the restaurant’s chicken . I dare say that it was almost better and it’s easy to make. So if you need a meal that will impress your dinner guests, look no further because here it is! Alice Springs is a city in Australia, hence the name of this chicken from Outback Steakhouse. This is a favorite dish for many Outback Steakhouse fans, and definitely a Six Sisters’ FAVORITE! Cook the bacon prior to putting the Alice Springs chicken in the oven. Need a quicker option? Buy precooked bacon at the store. Not enough time to let your sauce set overnight? No worries, it will still taste delicious! Sauté the chicken in bacon grease. Yellow mustard? Dijon mustard? Whatever you have on hand makes a great honey mustard. Experiment with the cheeses. Try a pepper jack or habanero blend. Turkey bacon and light mayo help cut the calories with the same great taste. Need some crunch? Add onion straws on top. Tastes great served over rice. This cookbook includes copycat recipes from Wingers, Texas Roadhouse, Starbucks, Panera, Cheesecake Factory, Kneaders, and so much more. We have you covered from drinks, to dessert and everything in-between.We are so excited to share these recipes with you. Order your copy today! Sprinkle and rub the chicken breasts with seasoning salt. to 5 minutes per side, or until browned. Move chicken to an 11 x 7 inch or 9 x 9 inch pan. juice together in a bowl. Cover and chill in refrigerator. See how easy it is to make our FAVORITE Chicken Recipes in the Instant Pot! Ooh, la la!!! Gonna try this one this week!! you had me at baccon and cheese. I order this everytime I go to Outback. The picture looks VERY different from their's, but I am definately going to try it and see how it compares. this is my favorite thing to order at outback, because im not a huge steak fan. will definitely have to try this at home. yum! I am not a big mushroom fan. Me and my sister always make it with grilled onions on top instead. It is still amazing! This recipe sounds delish. I will have to give it a try. I am always trying to find good chicken recipes. OMG, this is my favorite dish at Outback! But the one where I grew up closed and I haven't been to one in years! DEFINITELY going to make this. So glad I found your blog. Made this sans mushrooms and my family loved it! Thanks so much for sharing! It made our night. This is SUCH A GREAT RECIPE!! Don't always have mushrooms in fridge, so have put in fresh diced tomatoes as either replacement or additive. ALL of family loves it either way (which is rare). Thank you so much!! I make this all the time. We love it. I make it like your Mom though. And I have found that the Chick-fil-A Roasted Honey BBQ sauce (or something like that, and it's kept behind the counter) makes it taste awesome!!! Whenever I go to Chick-fil-A, I ask for extras and take home the rest to use when I make this. This was delicious, I made it the other day, and it was a huge hut. I swapped turkey bacon and used light mayo and cheese to try and cut out some calories. Still totally delicious, thank you so much for sharing this recipe, it was very much so enjoyed! Looks yummy. Going to try this over the weekend. the recipe just says mustard - does that mean yellow mustard? for the sauce it specifies, but i didn't see it specified in the chicken recipe - let me know, thanks! I made this for my parents tonight and my Mom said how good it was 4 or 5 times. She happens to love honey mustard so the sauce especially was a big hit. Thanks for sharing the recipe! This IS an awesome recipe! I use it for company suppers. It's even better if you marinate the chicken in the morning in Worcestershire sauce/oil/balsamic vinegar - adds a lot. What are dried onion flakes - like what you would put on a green bean casserole? No, in the spice aisle they have dried onion. You can use dried minced onion. Just had this. It is AMAZING and easy to make too! Thanks so much! Gorgeous! And looks so yummmy! I made this tonight and it was fantastic! I didn't realize that I needed to make the honey mustard sauce to sit overnight, so it only had 3 hours. I don't think it made difference, it was the best part. Thanks for the recipe. Found you through Pinterest and made this tonight. It was a big hit! Thanks for the recipe; I'll be putting it in the rotation. Just made this and it was very good. I would definitely make again. Didn't have any mushrooms in the house so I didn't use them. I would next time. I also had chicken cutlets that were already sliced really thin. It would have been better to have them a little thicker. I used yellow mustard in the sauce that went on the chicken and it was very good. I think any kind of mustard would work, it would just give it a different taste. Didn't bother with the extra sauce. I could see this being a great company dish as you could prep ahead and then just put it in the oven when needed. Started to make chicken and my girls said, 'chicken, again!''. So I turned to this recipe and oh my! DELICIOUS! This is my girls' favorite at Outback. The sauce is identical. My husband and I skipped the cheese and the bacon and it was still yummy. Thanks so much for sharing! Have made this several times now!! It has become a favorite :) Absolutely delicious! I've made this before, and it's great! I have canned mushrooms this time...will that be okay? I think that canned mushrooms would work okay. Just drain them really well and you should be good to go! I made this tonight and was pretty pleased. I haven't had Alice Springs Chicken enough to remember how it tasted but Husband said it was "close". Upon taking his first bite, he looked at me and said "THIS is tasty!" I'm pretty sure this will now make a regular showing at our table. Thanks! Are the chicken breasts frozen or thawed when you rub with seasoning salt and then refrigerate them? We made this last night and OMG IT IS SO STINKIN GOOD! We sauteed our chicken in the bacon grease (can you just feel your arteries clogging with yummy goodness?) and holy cow--totally worth it. Next time, we're going to add caramelized onions to the mix. We're also going to attempt shredding the chicken and making quesadillas! Shared the recipe with my MIL and she can't wait to try it. Made this tonight. Totally LOVED!!! This is my favorite dish at the Outback and it totally satisfied me! Hubby didn't love it, but it's also not his favorite dish and he's not a fan of mustard anything. :) The honey mustard mix tasted identical. Thank you!!! my family LOVES this. I make it and put it over rice on the nights I have to make it last. I made this tonight and it was fabulous! Thanks so much for sharing! I will put this on the rotation for dinner for sure! Love it! Made this for dinner tonight, very delicious the whole family loved it. I didn't bother with the extra sauce though. Thanks this is a winner! I accidently omitted the mayo. Is that going to make a difference? Made this tonight ...very very yummy!!! Do you cook the bacon prior to putting the chicken in the oven? Yes, cook the bacon first. I made this tonight. It was great. I left out the mushrooms because I'm not a fan and neither is my boyfriend. I did however cook little red potatoes and carrots and put them on the bottom of the 9*9 pan. It was delicious. And like I read above, no leftovers for me either. I'll have to make more next time. What sides do you normally serve with this dish? We have a lot of side dishes on our blog that would go well with this. A salad goes well, some potatoes and any of our veggie recipes. Hope this helps. On the front page of our blog click on Categories. Then you see salads, sidedishes, and all kinds of ideas. I love this! It is delicious! I fixed this for supper tonight for me and the hubby! It was really, really good! Will do again. This was a hit! The picky Man of the House loved it! The dipping sauce really did add to the flavor. Delicious! Greatest recipie. Family love it. .
Is the extra sauce necessary or will this be tasty enough without more sauce. One reviewer suggested putting cut up cooked pink potatoes and carrots on the bottom of the casserole dish. That sounded like a nice idea. I am planning to make the recipe and want to decide if I need the extra sauce. Thanks so much. This is tasty with or without the honey mustard sauce. I am making this tonight! Looks so yummy! I cooked a whole chicken in the crock pot last night. Will it make a difference if I use cooked chicken?? It will not need to cook as long since your chicken is already cooked. You will want to be sure everything is heated through and the cheese is melted. Wonder if this would be good with onion straws on top? This was outstanding. The only changes I made was no Lawry's salt (I didn't have) and next time I will put the cheese on the last 10 or 15 minutes. Hubby loved also and it is a keeper. I made this today and it was amazing. The kids loved it. I made some nachos on the side and added some scallions. Thank you so much for this recipe. I will definitely make this again. This recipe looks awesome...always wondered what was in the chicken....as coming from the real Alice Springs in Australia i never felt the need to try our namesake dish when i visited an outback steakhouse...needless to say this is also in no way an actual dish native to Alice Springs!...Looking forward to trying it! Can I use microwave already cooked bacon?? Microwave bacon will work because you cook the bacon first before adding it to the top of the chicken. I just got ready to make this for tonight and read all the way through and realized the honey mustard sauce needs to set overnight. Is this going to be as good without it? You will be fine not letting the honey mustard sauce set over night. You definitely want it with the chicken. This turned out so good! I fried the chicken in the leftover bacon grease....eeek. It tasted so good. I only had lime juice on hand so I used that as a substitute for the lemon. Love this recipe! This is SO good made with jalapeno & banana peppers! We didn't have bacon & my husband doesn't like mushrooms so we just used what we had and omg it's so delicious. So much so that HE decided to make it again tonight LOL! made this tonight and it is a keeper! Was a bit salty but that could be from the seasoning salt. Used half yellow mustard and half Dijon as that's what I had on hand. Used "Habanero" cheese blend, again as that's what I had... Definitely added to the rotation! Thank you! I am confused why there are two sauces and that the chicken was not marinated in the first sauce (included with the chicken part). What do you do with the Honey mustard sauce? Is that to be included as a side sauce? I am sorry, but the directions and ingredients listed as is was confusing. Just comparing this recipe to some of the others out there and most marinate the chicken in part of the HM sauce prior to cooking the chicken. Thank you! Follow steps 1-5 in the instructions using the ingredients under "chicken". 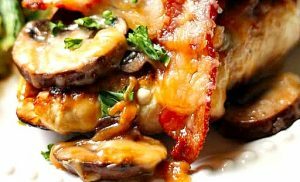 It will tell you to apply the honey mustard mixture over each chicken breast and then topping it with the mushrooms and cheese. In step 6 it says to serve it with the honey mustard sauce. The honey mustard sauce ingredients are all listed and how to make it is explained. You serve that on the side of the finished recipe. It's great for dipping. Hope this clarifies things. Just go step by step and the ingredients are listed in the order used. Absolutely amazing! Thank you! The only Thing I ever order at Outback Steakhouse is Alice Springs Chicken. I have to admit that this was better than Outback!